In the Harry Potter world, there was a character by the name of Beedle the Bard, who told a story about witnessing the three Peverell brothers building a bridge out of magic and successfully crossing a very dangerous river that had claimed many lives. Death was upset that they had survived, but being the sly and cunning figure that he was, offered to give each brother an artifact of great power knowing it would eventually lead to their deaths. The Peverell brothers chose the Elder Wand, Resurrection Stone, and the Cloak of Invisibility, which later became known as the Deathly Hallows. 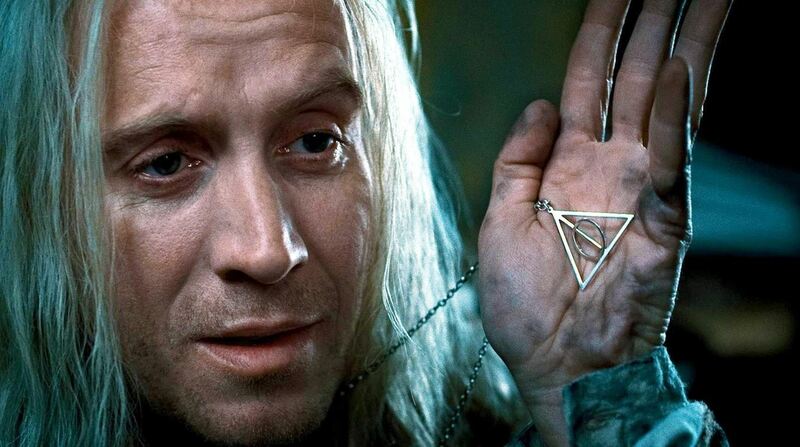 The symbol for it can be seen below, in the hands of Xenophilius Lovegood. The symbol, and the three artifacts it represents, played a prominent role throughout the movie, helping Harry ultimately defeat Lord Voldemort. 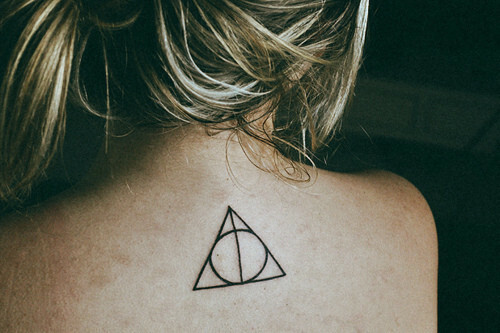 In fact, the symbol has been so popular that it spurred Muggles around the world to permanently tattoo the Deathly Hallows on themselves. While that is the epitome of dedication, it may be a little drastic for the rest of you. 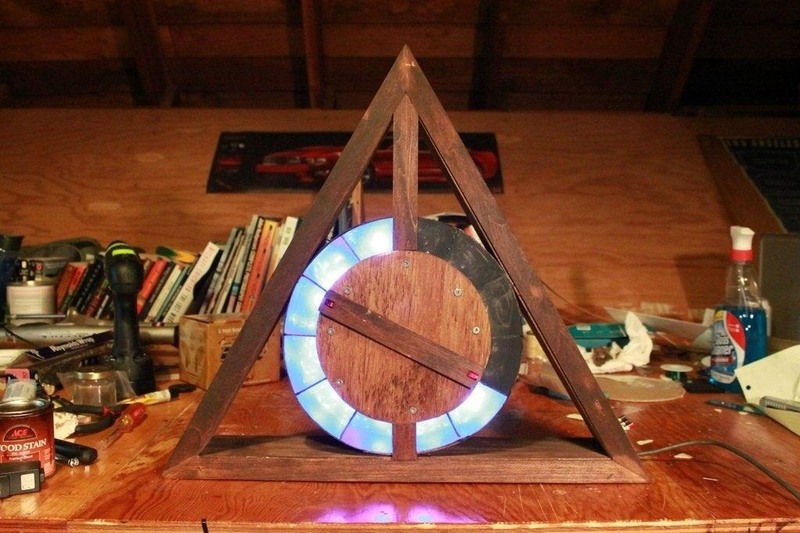 If that's the case, Reddit user yeenasty has created a Deathly Hallows LED clock that you can build yourself! The clock, made from craft wood and LEDs, is powered and controlled by an Arduino Uno Rev3 and can be plugged into a USB wall outlet. The LED ring partitions represent the hours, while the wooden hand stands for minutes. At midnight, all of the LEDs are turned off, with each one turning on by the hour. At noon, all of LEDs are turned on, with each one shutting off for each hour passed. The first step he took was designing the triangle shape, representing the Cloak of Invisibility. 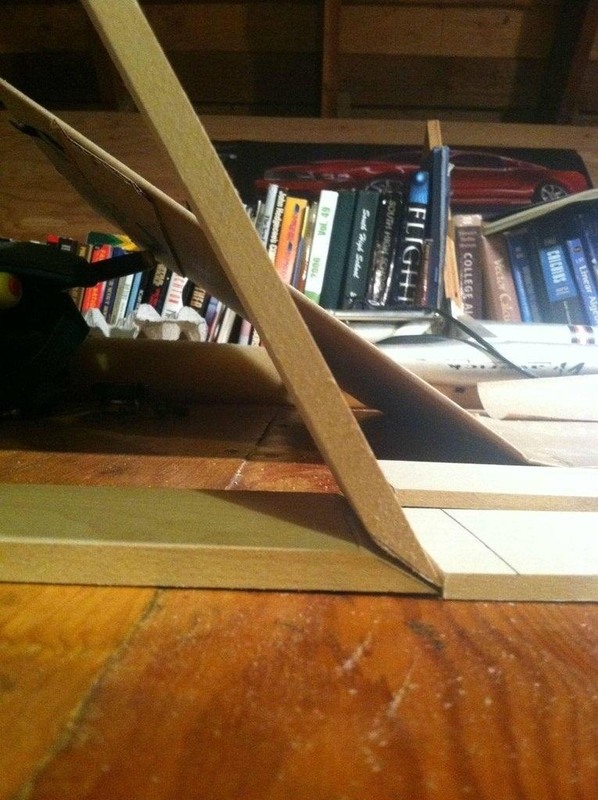 He cut the each end of the three pieces of wood into 30 degree angles—something he said was very tedious. 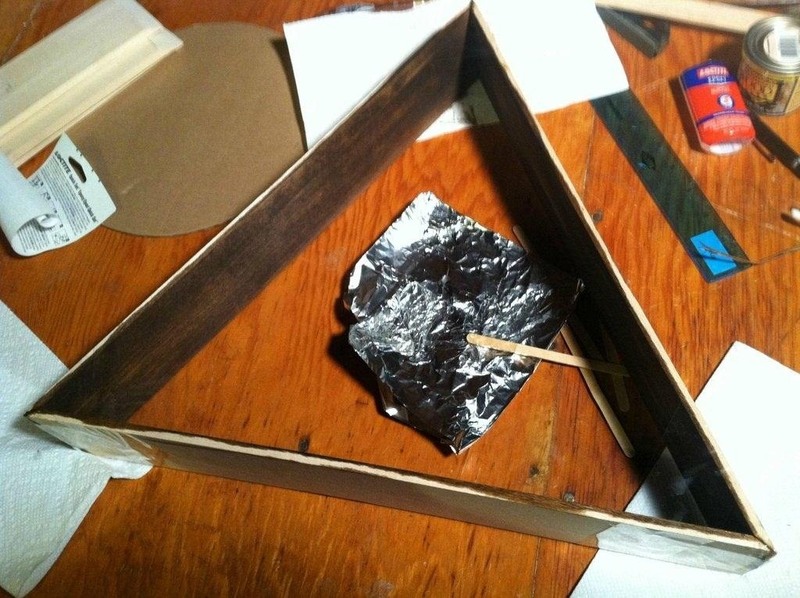 He then stained the inside of the triangle and glued the three pieces together. 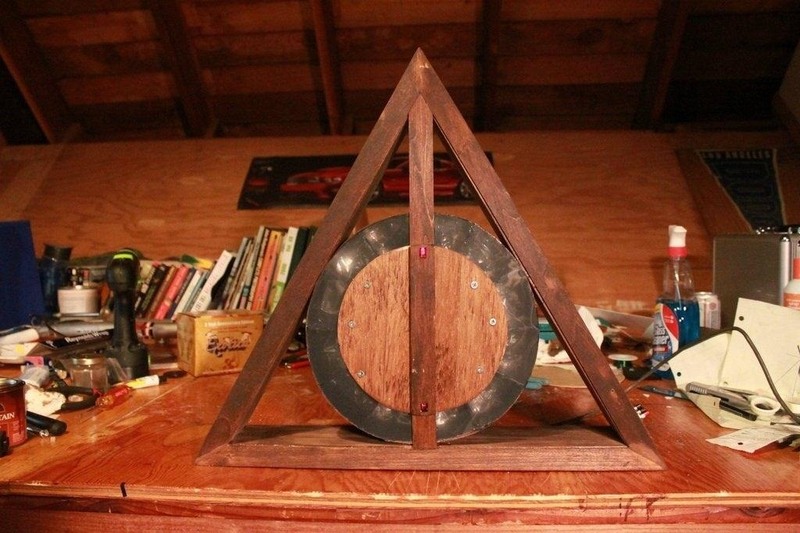 He then designed the circle part of the clock, representing the Resurrection Stone. 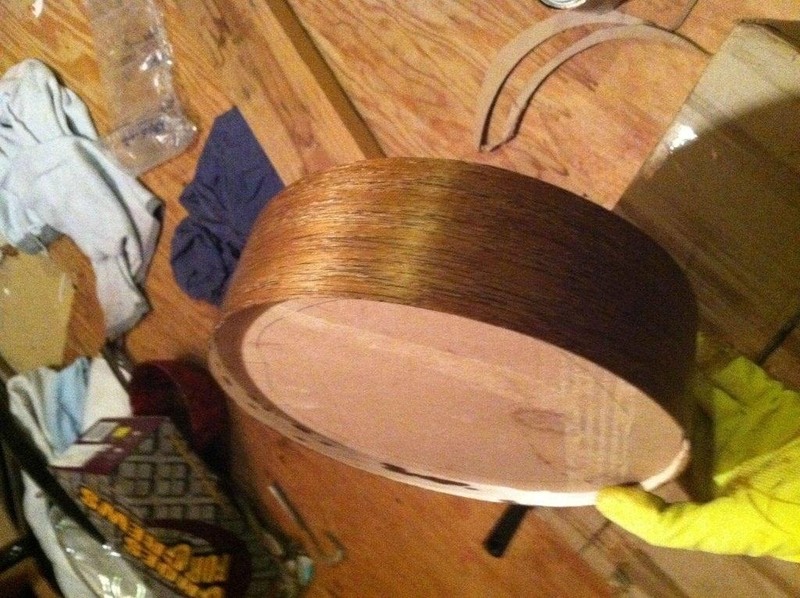 He used really thin wood and wet it to bend into the perfect circle, which he then glued with epoxy at a 10 inch diameter. He also stained the outside of the circle. 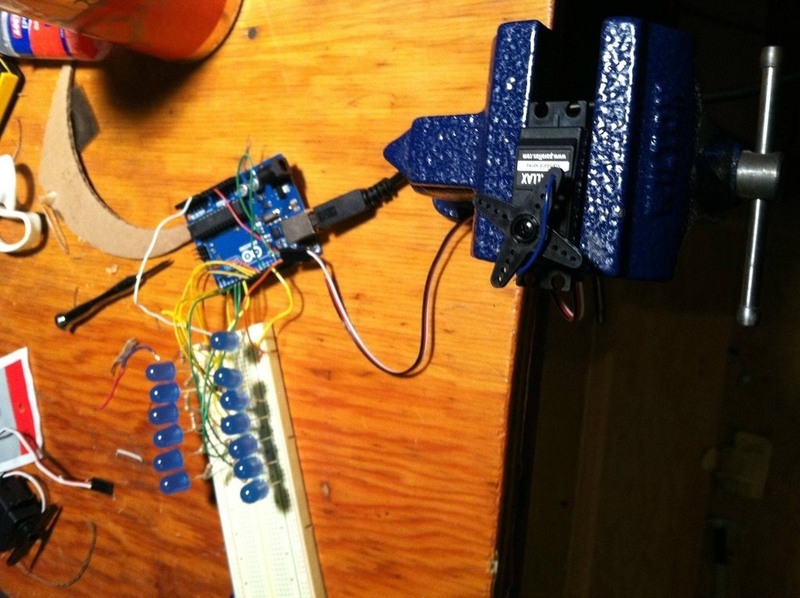 In the next step, he tested the circuit to try out the code for clock, using an Arduino. 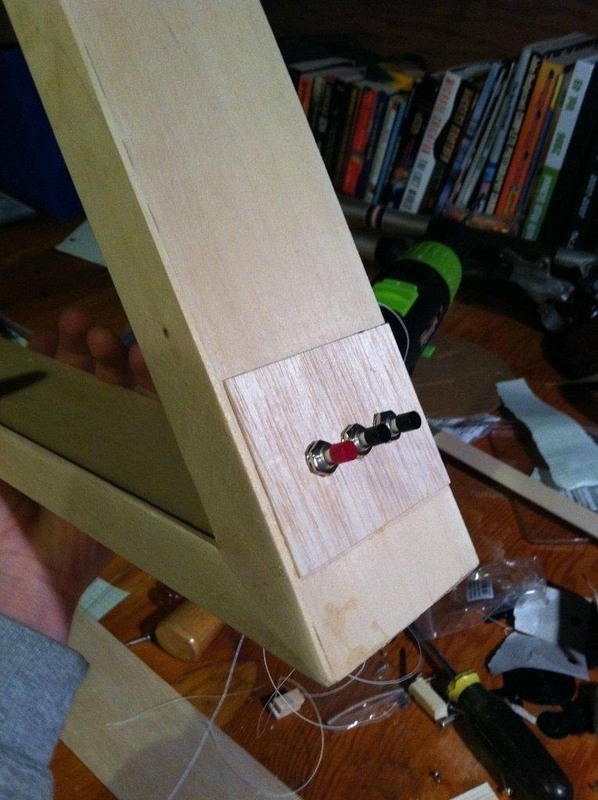 He then used 12 LEDs for the hours, two smaller red LEDs for the minute hand, and a 180 degree servo. He added buttons on the side of the clock to control the hours and minutes. 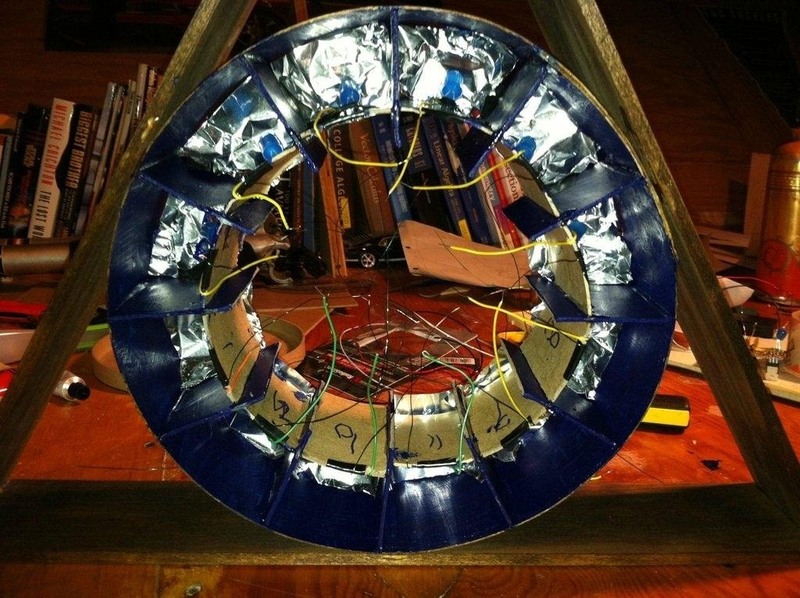 The hour partitions were then inserted into the circle and painted blue. 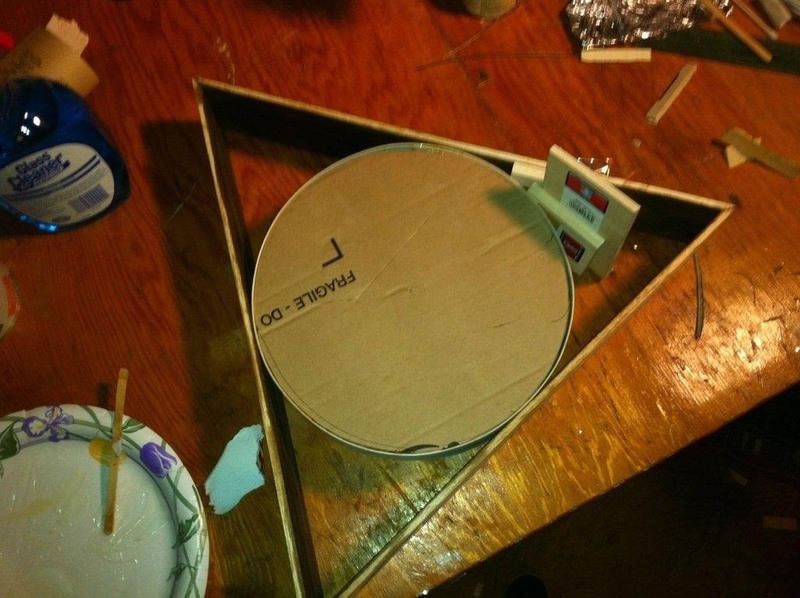 He added a cardboard to the back of the circle to hold the Arduino. 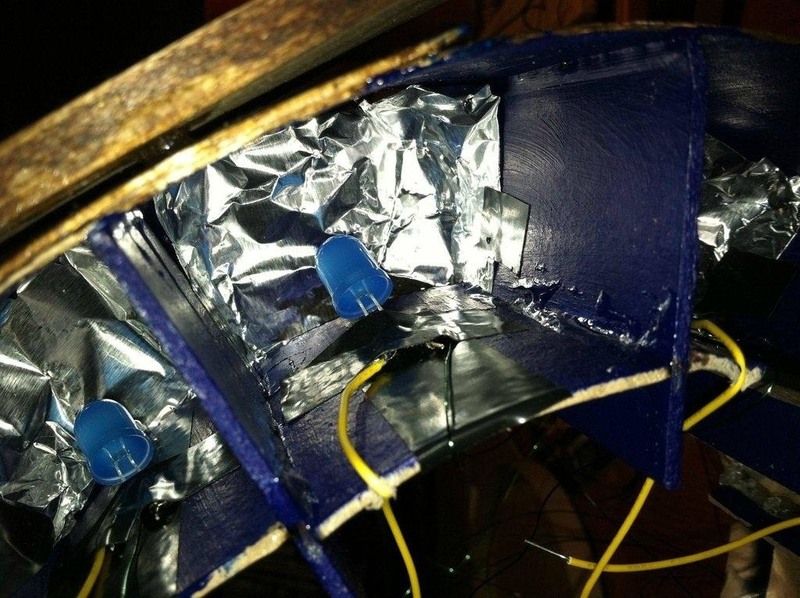 He then added foil to reflect the LED light and inserted the LEDs pointed downward, all covered with a dark folder to dim the LEDs. He used electrical tape layer of epoxy to reinforce everything. 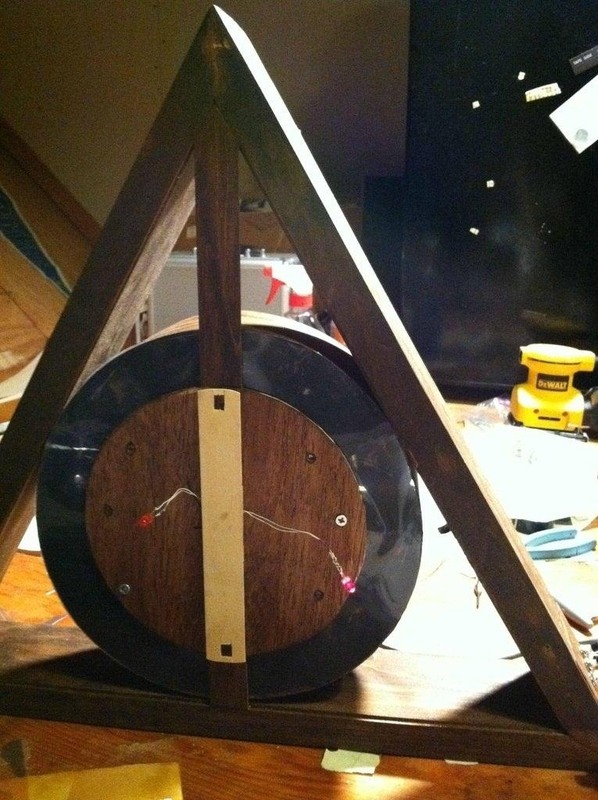 The final step was designing the front plate of the clock, lining the straight piece of wood across the front of the clock (representing the Elder's Wand), adding the minute hand, and staining the rest of the clock. 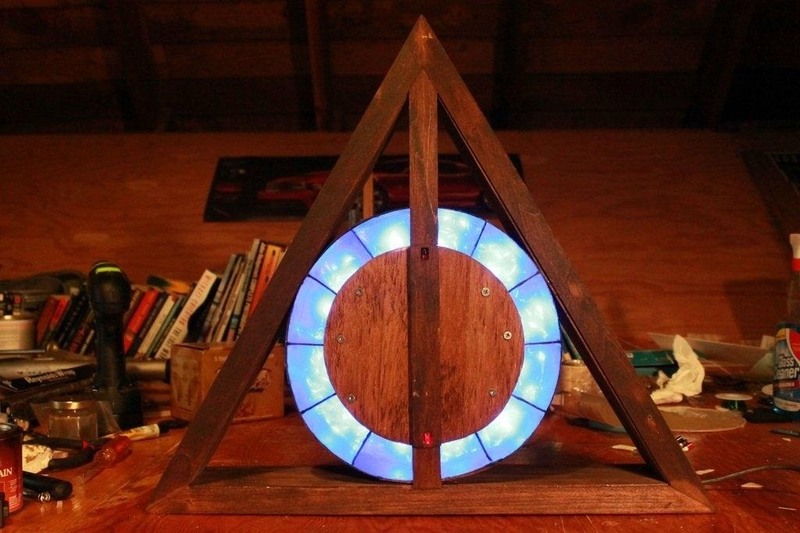 Now you have your very own Harry Potter-inspired Deathly Hallows clock—for all of you nerds that don't want to quite permanently stain your skin with some tattoos. This is the clock at 4:20 PM, in case you couldn't figure it out. Check out the Imgur album for the full build. 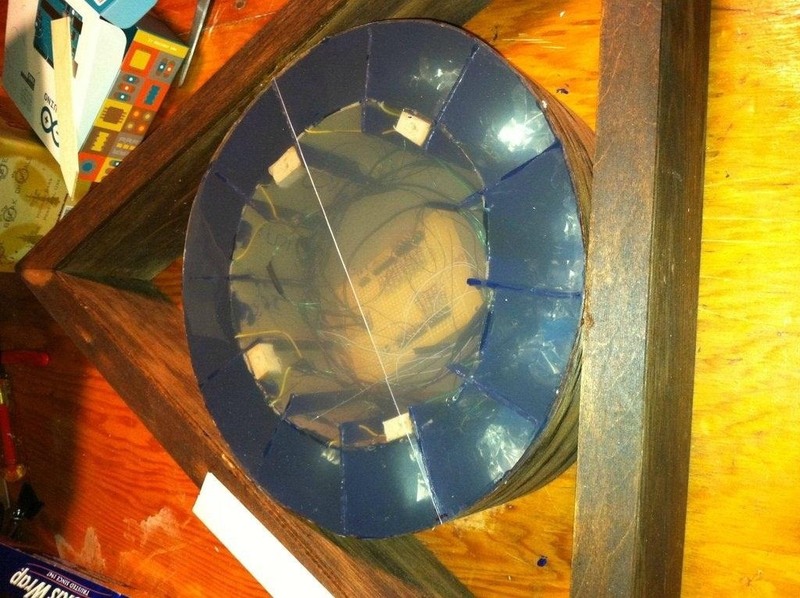 Hi, I would love to make a replica of this on my own , but I need some help, as in could you please send me a detailed description of the code used to run the clock , what kind of Arduino and other instructions on how to connect it all up. Yeah, you can actually email yeenasty (the creator) at yee.phillip@gmail.com (he says if anyone is interested in hearing more about the clock, to just email any questions to him).